The SanDisk 32GB microSDHC Extreme Plus Memory features max read speeds of 80MB/s and write speeds of 50MB/s with minimum transfer rates of 10MB/s. This is suitable for up to Full HD 1080p. This rental comes with a microSD adapter so that you can pull down footage from this card via a full-sized SD slot. Please note, however, that this card does not come with a card reader. 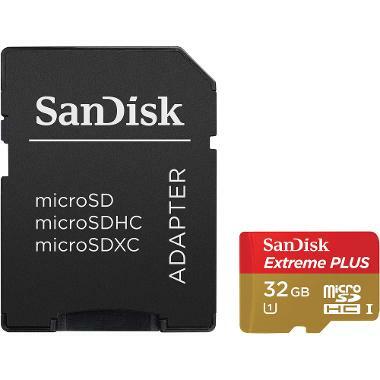 • A microSD adapter is included so that you can put this card into regular SD slots.